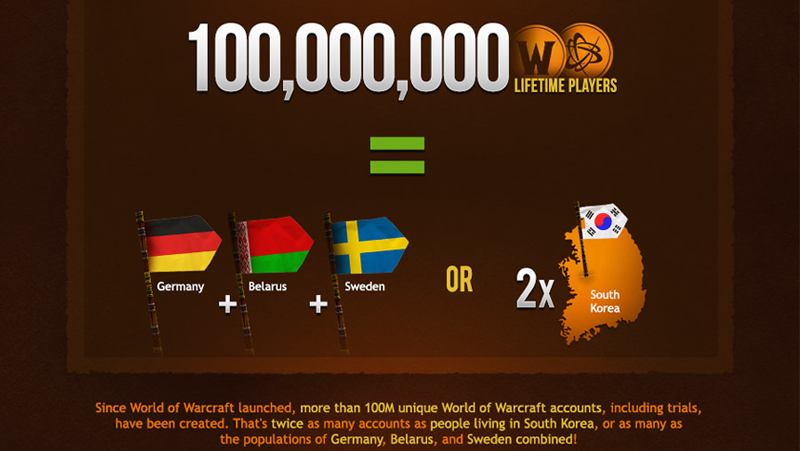 Blizzard have just put out a really cool infographic detailing some of the ridiculous numbers behind World of Warcraft as it heads into its tenth year of operation in 2014. Ever wanted to know how much text is in WoW? Or how many gigs the Blizzard rock band Level 90 Elite Tauren Chieftan have played in Azeroth? Click through to find out! The infographic covers some interesting stats from WoW's almost 10 years of existence, from Faction balance (52% Alliance, 47% Horde, and, bizarrely enough, 1% Neutral) to the amount of in-game audio (3900 minutes of it), to a break down of daily multiplayer activities (900,000 PvE instances like raids or scenarios, 600,000 PvP matches, and 3.6 million Pet Battles - WoW Pokémon is popular! ), and more. A lot of the data is almost unfathomable to comprehend as being for a single video game - let alone one that is 10 years old now. It's crazy, and it cements just how bizarrely anomalous a game like WoW is - and even if you don't like it, the impact Azeroth has had on video games and popular culture is something to respect. After all, how many other games can sustain an audience so big, after a decade of existence?